The Verification Academy focuses on key aspects of advanced functional verification, including: UVM, Coverage, Assertion-Based Verification, Verification Management, CDC and Formal Verification, Acceleration, Requirements Verification, Portable Stimulus and more. 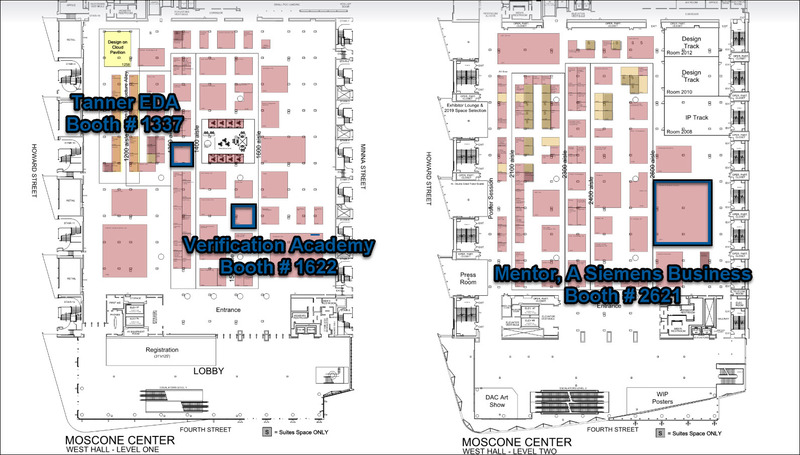 At this year's Verification Academy Booth, we lined up an excellent set of industry experts to speak - covering a wide range of topics of advanced functional verification techniques. For those of you not able to attend live, we recorded the sessions to make them available to all our members. You will need to login with your Full Access account to view or download the booth theater session videos and slides below. Create an account and become a member. The new Portable Stimulus Standard from Accellera provides the next leap in verification productivity for SoC verification. From a single abstract specification of test intent and coverage, tools can automate the generation of multiple target-specific test implementations for different platforms throughout the verification process, from virtual prototypes to RTL simulation, emulation, FPGA prototypes and post-silicon, freeing the verification team from the tedious and error-prone process of trying to re-implement tests in different languages. This session will provide an overview of the new Portable Stimulus Standard, show expected use models and provide some concrete examples of how to apply this exciting technology. We will also show how Questa inFact, Mentor’s portable stimulus solution, will allow you to witness the power of this fully operational standard. With the approval of the IEEE 1800.2 UVM Standard, and the new Reference Implementation from Accellera, UVM has reached its peak as the dominant verification methodology available. This session will start with an overview of the changes in UVM 1800.2 from UVM 1.2 and 1.1d so you can be prepared to embrace the new Standard. To accompany this release, we have updated the online UVM Cookbook both to take advantage of some of the new features in UVM and also to guide you in creating testbenches that can be reused in all available engines, including emulation. We will also see how the UVM Framework will automatically build your environment according to these new guidelines, letting you get a UVM environment up and running in just a few hours. Even if you’ve been using UVM for years, we’ll show you how you can be even more efficient and portable in creating your UVM environment. CDC Analysis at SOC level involves huge challenges in terms of capacity, quality of results, and ease of debug, dependencies and ownership of IPs. The flagship SOC designs are typically the biggest and the most complex. IPs are sourced from both internal as well as external design teams and they are integrated at the SOC level later in the design cycle. With the hierarchical approach, CDC analysis can be done in a bottom-up approach wherein CDC analysis for the IP level is done first and its abstract model (HDM model) is created based on SOC/Subsystem level parameters and configurations. An HDM model provides an abstract representation of the IP, but also with visibility of the internal logic. When consumed at the SOC level, HDM models improve ease of debug, performance and quality of results. It’s Been 24 Hours – Should I Kill My Formal Run? This time yesterday you kicked off a formal analysis – and it’s still running! Is it making any progress, or should you kill it now and start over? In this talk we will show how to make an informed decision using “engine health” monitoring, a snapshot of the active logic being used by the analysis, and making an honest appraisal of the assumptions you applied at the beginning of the run. Plus: we’ll show how a secure mobile app can be employed to keep track of progress of formal runs when you are away from your workstation. With so much of the buzz about the emerging Accellera Portable Stimulus Standard centered around applications in the system level space, it might seem that this is the sole application for the technology. However, users have long been applying portable stimulus techniques across block, subsystem, and SoC-level environments to improve their verification productivity. This presentation will show how Mentor’s inFact portable stimulus tool is applied across the verification spectrum and the spectrum of verification engines to achieve more verification with the same resources. Artificial Intelligence and Deep learning based applications are the main drivers behind the current exponential increase in demand for computational power. This demand is predominantly being addressed now by GPUs instead of traditional CPUs. GPUs are high-performance, high-throughput chips which require I/O bandwidth of the order of Gbps and high-bandwidth memory interfaces. This talk will provide an overview of the AI and deep learning applications using GPUs, the added complexities on AMS verification and the methodology used to address these verification challenges in efficient and predictable ways. Major trends such as ADAS/Autonomous driving, Connectivity and Advanced security are on the verge of revolutionizing the way automobiles are used. These trends bring significant implications for the design and verification of increasingly complex electronic systems. For instance, ADAS/autonomous driving demands much higher levels of HW/SW integration and complexity, and a huge quantity of sensor data that needs to be processed. And of course many functions are safety critical as defined within the context of ISO 26262. All of this puts massive strain on current verification techniques, and requires the emergence of new equally innovative verification technologies to answer to all aspects of automotive electronics design. Join us for this session as we explore how the Veloce Emulation platform is positioned to deliver optimal verification solutions for the automotive market. No One Expects Gate Level CDC Verification and Glitch Detection for ASIC Signoff! The algorithms to teach a computer to “see, understand and make decisions” for ADAS and Autonomous Drive systems require a significant amount of parallel compute performance executing at the lowest possible power. This session will introduce why HLS (High-level Synthesis) is such a good fit for computer vision and deep learning and how it can be used adapt rapidly changing algorithms and/or trained neural networks to low-power, high performance custom hardware accelerators. Do you verify your designs or do you validate them? Trick question! While related, validation is different from verification, not a synonym or replacement for it. Validation certifies the SoC is true to the marketing requirements. That is, if marketing did their job right, then validation ensures the SoC will be a successful product. As challenging as verification is, validation is even more so. Let’s explore how to validate all dimensions of functionality, performance, power and potentially for systems-on-chip. Cliff Cummings - Sunburst Design, Inc. The UVM class library is mostly composed of virtual classes with virtual methods. When overriding a virtual method, SystemVerilog, requires the use of the exact same method prototype, which requires verification engineers to do upcasting and downcasting. This presentation shows how upcasting and downcasting work and how they are frequently used in UVM testbench environments. Functional Safety compliance has taken center stage in the automotive industry with rigorous, semiconductor-level processes and failure targets embodied on the ISO 26262 standard. Certifying such compliance to the relevant ASIL tier, particularly in the face of growing design complexity and closer assessment scrutiny, calls for new paradigms and thinking. Traditionally, practitioners were able to rely on legacy architectures and use-models combined with targeted verification for selected logic units using customer-specific methodologies. For the highest safety levels, logic or component replication offered a way out. The enhanced scrutiny for level3+ autonomous driving made possible by new IC architectures makes the former approach unattractive while the economics of the hardware costs make replication unviable. From a standards perspective, the preference for Fault simulation is made clear but safety engineers face a few obstacles to widespread adoption of Fault sims as the de-facto methodology. In this presentation, we will review some of the hurdles holding the industry back from conducting exhaustive fault campaigns and some innovative approaches to solving them. Also included is a review of acceleration strategies and best practices to enable them. We compare the Accellera Portable Test and Stimulus Standard (PSS) with the Universal Verification Methodology (UVM), and ask exactly what the difference is between the two when it comes to generating stimulus for hardware verification and SoC verification. Power Aware simulations play an important role in the System resources block verification. However parametric UPF brings about its own challenges with respect to simulating it in a regression environment. So there is a need to load a dynamically generated UPF based on varying parameter sets. Questa Power Aware helps simplify this effort with loading the UPF in the .tcl format. The parameters like number of watchdogs are set in a configuration file which is used to generate a dynamic test tree which contains a tcl file that loads the UPF. This tcl file is then passed into the optimization stage of the Questa Power Aware tool to load the UPF. UVM tests can now be run with these dynamic test trees to get power aware simulations to cover the wide parameter space. With Coverage Intent, and Test we now have the means to directly connect functional coverage and test status to the requirements they meet. Work items can be linked together in custom relationships. This session will defined a “Verified by” relationship between the Verification Requirement and the Coverage Intent work item and the Verification Requirement and Test work item. The final pieces needed to close the loop is the proof that the coverage item was met in a passing simulation. Lastly will discuss how to import the report, parse the coverage item and test names, and back-annotate the Coverage Intent and Test work items with their corresponding coverage percentages and status.